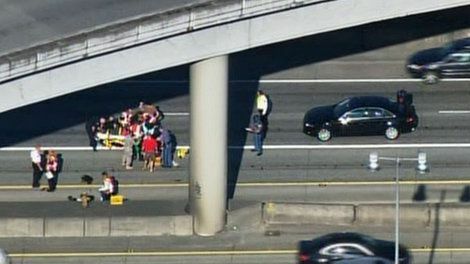 A woman was hit by a car in Seattle Thursday morning while she was standing in the high occupancy vehicle (HOV) lane of southbound Interstate 5. According to King5.com, the vehicle involved in the accident was traveling at typical highway speeds when it struck the woman on I-5, just south of the Interstate 90 junction. The woman was seriously injured in the pedestrian accident and was taken to Harborview Medical Center to be treated for her injuries. The woman’s condition is unknown and it is not clear why she was standing in the freeway lane. There were no other injuries reported and no other people involved in the collision, but the morning Seattle traffic suffered as a result of the crash. The number of traffic fatalities in the State of Washington declined from 633 in 2006 to 458 in 2010. The personal injury lawyers at the Davis Law Group help vehicle accident victims get financial compensation for their injuries and lost wages. We work closely with the criminal prosecutor to make sure that all avenues, both criminal and civil, are being pursued. If you have been the victim of a vehicle accident, contact Davis Law Group at 206-727-4000.